The countdown to the launch of Belize Facts and Figures has begun. Home » Blog » Uncategorized » The countdown to the launch of Belize Facts and Figures has begun. In 1492, Christopher Columbus rediscovered the Western Hemisphere when he landed in on the island of El Salvador in the Bahamas. Columbus returned on three more voyages. On his fourth voyage in 1502, Columbus entered the Gulf of Honduras and sighted the Toledo district of Belize. Columbus also interacted with a large Maya canoe carring goods from the Yucatan to Honduras. Other Spanish voyagers who also came close to Belize but remained outside the reef included Vicente Yanez Pinzon and Juan Diaz de Solis who sailed near to our country in 1506. One of the first Spaniards to settle in Belize was a shipwrecked sailor by the name of Gonzalo Guerrero. In 1,511, Guerrero was captured by the Maya living in the Corozal district. Guerrero was not killed but he married Sasil Ha, the daughter of the Maya chief (Na Chan Ka’an) who had captured him. Guerrero changed his allegiance and fought along with the Maya to defend their territory from the Spanish. Initially, the Spanish were not interested in the land that Belize now occupies because the land was thick with bush and, because much of it is calcium based, it was devoid of precious metals. Also, there were not many natives who could be captured and sent as slaves to Hispanola. This is because there were few communities compared to northern Yucatan. The conquest of northern Yucantan, started by Francisco de Montego in 1526, did not pay much attention to the southern Chetumal or Dzuilinicob Maya provinces until after Yucatan was conquered in 1542. After northern Yucatan fell, the Spanish then turned their attention to the sourthern provinces of Chetumal and Dzulinicob in southern Mexico and Belize. The conquest of Chetumal by Melchor and Alonso Pacheco was one of the most brutal episodes for the Chetumal Maya. Between 1543 and 1544, the Pachecos used trained greyhounds to kill and eat the natives. People were tied to the stake and burned as well as weighted down and drowned in lagoons. Hands, noses, ears and breasts were cut off and people were starved to death. These encomendias were required to pay tribute in the form of cotton, honey, beeswax, corn, cacao or other foods or useful biological materials to the Pachechos and their agents. 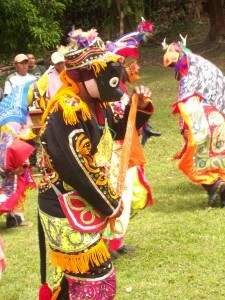 Accompanying the Pachecos were Fanciscan priests tasked with to convert the Maya to Christianity. The priest assigned to oversee the conversion of the Belize Maya was Fr. Lorenzo Bienvenida. Fr. Lorenzo was critical of the way the conquest was done and reported, to the Spanish Crown, the cruelties and atrocities meted out to the Maya. These atrocities also spurred the Maya on to continue fighting and in 1547, the Maya of Chanlacan killed their administrator. Another effect of the conquest of the Chetumal province was that the Maya of southern Mexico started to head for safe haven in Belize- they headed for Tipu. Although Tipu was an encomendia, the arrivals from the north would see Tipu become a centre of rebellion. However for the time being, the Franciscan priests developed visitia churches in Tipu and at Lamanai in the 1620s. Two sites where the Spanish were successfully able to temporarily form entradas were Lamanai and Tipu. However, by the early 1630s the Maya at Tipu began forming an alliance with the Itzas of Nohpeten (What is now Flores, Guatemala). The Itzas were unconquered at this time and they formed an alliance with the Tipuans. Thus by 1,641, the Maya residing in Belize were in full rebellion against the Spanish who were forcefully expelled from Tipu in 1639 and from Lamanai in 1641. The churches built at these two encomiendas towns were destroyed. These successes of the Maya living in Belize was however not indicative of the overall situation in the Peten. The Spanish realized that they needed to conquer the Itzas living at Nohpeten. The original plan was to enter Peten via Tipu. This would have been facilitated by the residents of Tipu themselves when in 1695 they requested priests and agreed to cooperate with the Spanish. However, when the time for the conquest of the Itzas came, the Spanish used a more direct route constructed from Merida and the Itzas were conquered in 1697. By 1707 the Spanish moved the residents of Tipu to Nohpeten after British slavers raided the settlement.